Protesters at Los Angeles International Airport on January 29, 2017. Photo courtesy of Cindy Chu/Flickr. At 3 p.m. on January 28, 2017—the day after Donald Trump signed an executive order banning travel to the United States by citizens of seven predominantly Muslim countries—I frantically tried to stop the departure of a plane carrying Ali Vayeghan. Mr. Vayeghan is an Iranian man who had arrived at Los Angeles International Airport (LAX) the night before; he was planning to start a new life with his brother in the United States. Like thousands of others with valid immigration status, he was being detained and was set to be deported as a result of President Trump’s ill-conceived travel ban. Desperate family members scrambled behind me and protesters gathered outside. I presented a Customs and Border Patrol (CBP) officer with a habeas petition I had rushed to assemble with other civil rights lawyers. The officer was unmoved. The plane took off. “This is America,” the officer impatiently explained. This was not an America I recognized. I have been an immigrants’ rights lawyer for nearly a decade. During that time, the primary focus of my work has been serving those caught up in our nation’s broken immigration detention system: asylum seekers, long-time lawful permanent residents, victims of domestic violence and human trafficking, individuals with serious mental disabilities. I am not unfamiliar with the dark side of America’s immigration system. But, like so many others, I was caught off guard by the scope of the executive order, and the swift damage—both personal and political—that it caused. Legal services offered to immigrants at Los Angeles International Airport on January 29, 2017. Photo courtesy of Cindy Chu/Flickr. When I arrived at LAX the morning of January 28, chaos was already taking hold. The travel ban, announced the previous evening and put into immediate effect, was being used as pretense to detain hundreds of predominantly Muslim travelers entering the United States with lawful immigration status. Green card holders were turned away, students sent home, grandmothers and children held for hours on end. Lawyers from across the city organized in the airport—and behind their office desks—to advocate for those detained, to document abuses, and to file lawsuits. 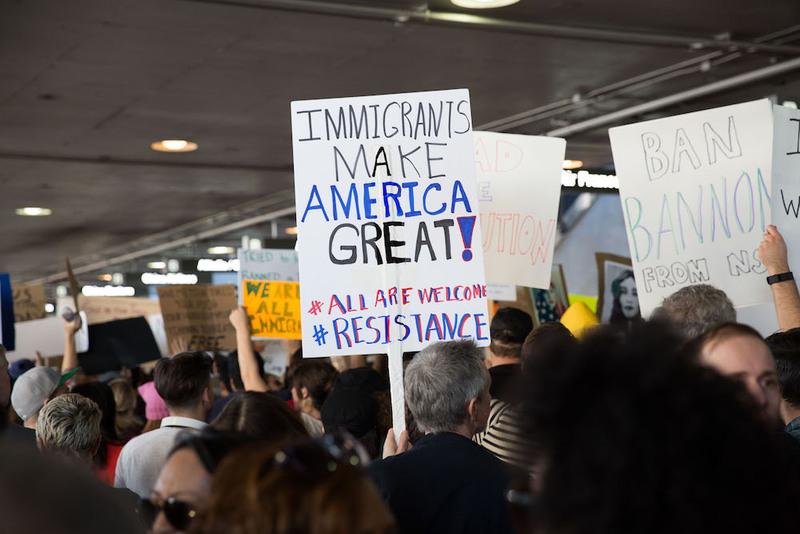 As the weekend wore on, hundreds of lawyers and thousands of people from across Los Angeles took to the airport terminals, sidewalks, and even parking lots in a massive protest against the president’s hate-driven and unlawful ban. And we won. The courts deemed the first travel ban unconstitutional. Those wrongfully denied entry were permitted to return, including Mr. Vayeghan. Indeed, the court ordered the government to facilitate his return, and he entered the United States as a lawful permanent resident later that week. But as the protesters headed home and we folded up our makeshift airport law offices, the battle was far from over. That CBP officer’s vision of America continues to reign. In early March, President Trump issued a revised travel ban grounded in the same anti-Muslim animus as the first. That ban—which suspends the entry of foreign nationals from six Muslim-majority countries without previously-issued valid visas, and stops the admission of refugees for 120 days—was initially halted but ultimately permitted to go into partial effect after a series of court cases that will be resolved by the Supreme Court in its next term. After each turn of events, immigrants’ rights advocates (myself included) headed to the airports to answer travelers’ questions and assist in cases of wrongful detention. But the nature of the challenge has changed. Because the revised travel ban prevents the issuance of new visas from the six countries (with certain court-ordered exceptions for those with close ties to family or U.S. entities), we are no longer seeing mass detentions at the airports. This is because many people are not able to reach our airports. Instead, the real impact is occurring at consular offices around the world, where government officials—with little to no oversight—are denying visas, and at refugee camps where those who have waited years to resettle safely in the United States are being told their futures will remain in indefinite limbo. It is harder to fight for those whom we cannot see. To be sure, the airport remains a contested site. The havoc wreaked by the travel ban was spurred in large part by CBP’s existing faults—a culture rife with abuse and lack of accountability—that were only exacerbated by the Trump administration’s green light. A new report issued by the American Immigration Council documents the agency’s past and ongoing indifference to complaints of physical abuse, inhumane detention conditions, and the use of coercion and misinformation. And a recent article by The Nation describes CBP’s targeting of Muslim travelers since the September 11, 2001 attacks. It’s not surprising, then, that even while the revised ban does not technically apply to those with existing valid visas, we have seen increased scrutiny of Muslim travelers (whether from the six countries or not) as well as other travelers from around the world—students, family members, businessmen—as they attempt to enter the country. … the real impact is occurring at consular offices around the world, where government officials—with little to no oversight—are denying visas, and at refugee camps where those who have waited years to resettle safely in the United States are being told their futures will remain in indefinite limbo. The most egregious case of such scrutiny I have seen is the detention of an Afghan family with three children, including a baby, who was held at LAX for more than 40 hours. They had special immigrant visas granted to them because the father worked for the U.S. military abroad, placing his own life and that of his family at risk. Still they were detained. I was alerted to their case when those waiting to greet the family upon arrival at the airport never saw them emerge from inspection. A team of attorneys worked through the night to gain access to the family and to ensure that the mother and children were not separated from the father and put on a flight to a detention center in Texas. CBP never offered a justification for why it held them. The case required a lawsuit to win the family’s release from custody and, ultimately, their admission to the United States as lawful permanent residents. We don’t know how many more cases of people being wrongfully held and turned away are out there that we simply never learn about. To meet the challenges posed by the revised travel ban will require a sustained fight. The lawsuits must continue. Whether it be class actions to challenge the executive order’s constitutionality, or individual lawsuits to vindicate the rights of those like the Afghan family wrongfully turned away, the Trump Administration and CBP must be held accountable for their unlawful actions. We also need to redouble our efforts to uncover and respond to the stories of those we may be missing at our airports, consular offices, and refugee camps, and to develop both legal and political strategies to address their plight. But lawyers alone cannot win this fight. For the travel ban is not only an affront to our law and Constitution, it is an assault on our fundamental values. The thousands who showed up at LAX to protest against injustice and welcome the stranger must continue to speak out. Without a strong and sustained groundswell of opposition, we will not be able to turn back the divisive tide of which the travel ban is only one example. “This is America.” The CBP officer’s words have rung in my ears ever since that January day, as I—and so many others—fight for an America that embraces difference, values liberty, and promotes justice: an America that I recognize. Talia Inlender is a senior staff attorney in the Immigrants’ Rights Project at Public Counsel, a pro bono law firm in Los Angeles. This essay is part of a Zócalo Inquiry, Anxiety, Defiance, and Refuge in Immigrant Los Angeles, produced with support from The California Wellness Foundation.